If you call Arizona home, you know that your state’s biggest tourist attraction—bringing in over six million visitors a year—is the Grand Canyon. But what you may not be aware of is that on average, Arizonians are $6,500 in debt. If you’re in debt (like thousands of other Arizonians), there are different solutions available depending on your situation. Your ideal solution depends on the amount of debt you have, the kind of debt you have, and the time frame you hope to resolve your debt in. If you have more than $10,000 in debt, are willing to stretch out your payment period and want a simple monthly program payment, debt consolidation might be the solution for you. It’s time to take action against your debt. There are a variety of paths that can lead you to financial freedom, including debt consolidation. Arizona residents with high amounts could be eligible for secure loans from reputable lenders. Secure loans are loans created using collateral — high-value assets like your home or car. The value of these assets is leveraged to attain a loan with a reasonable interest rate from a lender. If you can’t pay your loan, you are at risk of forfeiting those assets. There’s a risk/reward element to debt consolidation, but as long as you stay on top of your payments, the risk portion shouldn’t be an issue. The risk is higher for the lender if you get an unsecured loan (meaning you have no collateral). Because they are taking on more risk, it’s likely that you’ll have a higher interest rate. If you can’t get a reasonable interest rate, you might want to find another solutions. 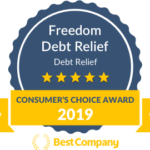 Arizona residents can call Freedom Financial at 800-910-0065 for a free debt evaluation to find a solution that is right for them. Call Freedom Debt Relief at 800-910-0065. You’ll receive a free debt evaluation so you can find the right solution that fits your unique debt situation. Choose a debt solution. Our trained debt specialists will recommend a debt solution to you depending on the results of your free evaluation. If that recommendation is debt consolidation, Arizona companies may just be a phone call away. Follow through to freedom. No matter which debt consolidation option you choose, the most important part is that you follow through. There’s nothing easy about resolving massive debt. It takes time, commitment and a willingness to work hard now. But it will be worth it to achieve financial freedom in the future. The average consumer has four credit cards. The average household is $6,500 in debt. Approximately 2.5 million Americans seek debt relief services from credit counselors each year for heavy debt burdens. If your debt feels as big and deep as the Grand Canyon, don’t wait any longer. Debt relief programs are currently available to Arizona residents – agents are standing by. Start your journey toward financial freedom today. Call 800-910-0065 now for a free debt consultation to find the best debt solution for you.